The QuickStart package includes dozens of protocols for training amplitudes, connectivity, symmetry and deep states, covering nearly any type of training that may be involved in a training plan. They simplify the process by allowing the trainer to choose what to train by simply clicking a button. Designs generally include automatically-set thresholds (which the trainer can adjust on-the-fly during a session. Most include graphs to show performance over the course of the session. They are organized by types of feedback, including NeuroPuzzles or BioPLAY games, video files, DVD files, and brain-trainer’s famous sound-based feedback, part of our approach to training for more than a decade, which allows the brain to create and play its own music which serves as the feedback to guide it. 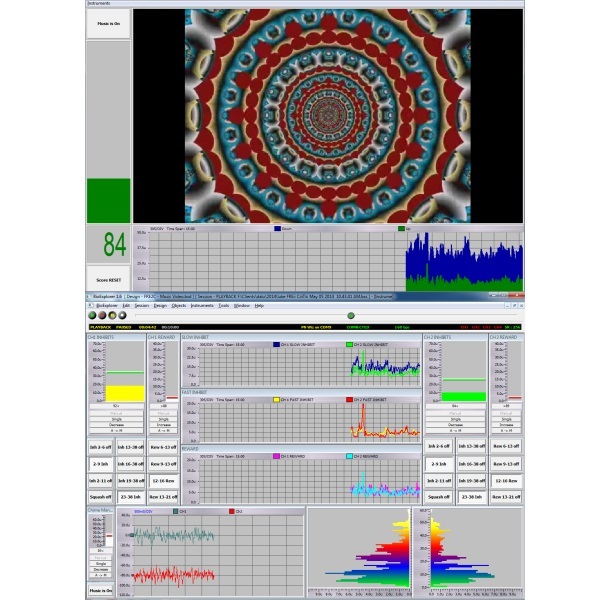 The BioExplorer QuickStart package includes protocols for training EEG in 1, 2 or 4 channels and for training HEG with various amplifiers (Pendant, Peanut, wiz). It is generally updated once a year. Many designs come with two screens, one for the trainer and one for the client, which can be used separately on two monitors from the same computer. The Design Package comes with a ”Clickable List” manual that allows the trainer to select any of the designs and read about how to use it, what sites and frequencies would be commonly used, etc. Note: When the design subscription is purchased with BioExplorer, the price is $150; when purchased separately, it is $200. RETURN POLICY: Since designs are software and not copy protected, returns are not accepted. CyberEvolution does not accept returns of BioExplorer. See complete list of supported devices. View recommended computer specs for BioExplorer.